birds : With another 2 Mistle Thrushes noted in the Fauxquets Valley on Wednesday, that makes 7 birds in the last month, which is pretty good to say I'd only seen one bird in the last two years. It would be nice to think that some of these birds will stay to boost the almost-extinct local breeding population but they will no doubt return to Eastern Europe whence no doubt they came. A beautiful adult Med Gull was with the other gulls on the beach at Rousse on Friday and 4 Great Crested Grebes were together in Belle Greve Bay at high tide today. The best sighting though was the Great Spotted Woodpecker which flew over the Cambridge Park trees about 10 minutes into the football match I was playing in. It must have been a good omen as we won for the first time since October against one of the top teams. I've only seen Great Spotted Woodpecker 3 times previously in Guernsey but now that they have started to breed here, I suspect they will become more regular. nonsense : Just recently, I had a parents evening. It flies by fine when you are actually talking to the parents, but the dead time between appointments is a real killer, sitting there like a plank, watching the clock tick slower and slower. I occupy myself doing this . . . . 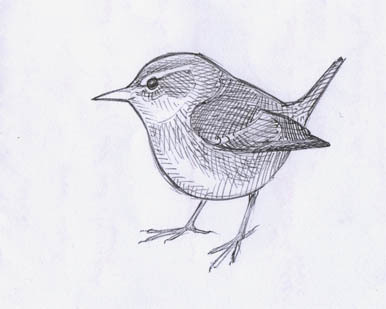 I was quite pleased by this sketch - its belly and rear end is a bit wrong but I liked the head. I wish I had time to do more drawing but I simply haven't - you can't do everything. One of the parents asked me if they could take this sketch home with them, but it was on the back of my notes about the children. 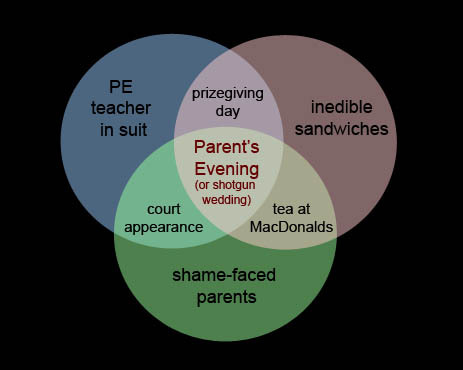 I also had a few other musings about parents evenings - see below.